This is an easy one, or one that takes slightly more effort, depending on the human making the toy. I’m always trying to get my Eclectus parrots to eat more vegetables, and any way I can do that, is a winner. 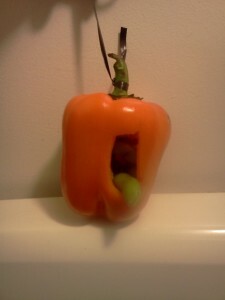 Note the piece of ribbon tied around the stem of the pepper, and the size of the hole cut in the pepper. For experienced foragers, that can be reduced to a slit, and other items *stuffed* inside. My birds are doing great with this – after taking all the stuff out from the inside of the pepper, they shred (and eat a lot ) of the the pepper. Result!